I hope I'm doing this right....never submitted art to a forum yet. 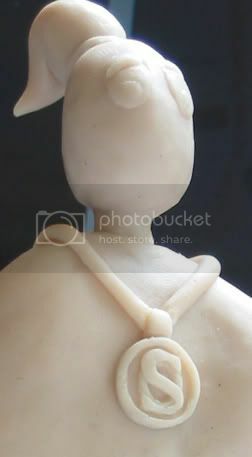 I made a Twinsen out of Super Sculpey some time last year because I wanted a figurine of him so badly! >_< But of course there's nowhere where you can find one of him so I made one! In fact, it's just what I got the pound of Sculpey for . I attached a pic from my comp as well as linked to the image online, is that okay? Last edited by Momiji; 2007-03-25 at 06:01. Wow.... This is really amazing! Yay a comment! XD Thank you!! Do you think this is the right section? Looks a bit like this one. Great job, man. Don't worry too much about the section you post in, it can easily be moved. Would you even have the power to move the thread? I see you listed as a super mod, but the only forum you are moderator in is still the Twinsunica forum, and you're not listed under "moderator in this forum" either. Yes, I do apparently. Maybe those lists are manually edited. super mods can mod everywhere, they are not explicitly listed as moderator for certain subforums. But I did create mine before I saw Kenobi's one. And that one makes me regret not giving Twinsen a face I think not giving him his mouth took away half his character. Oh well...bit late now. I think not giving him his mouth took away half his character. Oh well...bit late now. Do it separately and superglue it . I have, sadly, lacked the time however. Yup, that put me off too. Also, having to paint it nicely and such. Still, I'll probably do it sometime. Isn't it possible to buy a 3D printer, or is it still really really expensive? It would be so awesome if you did do it!! Though the cost is a bit expensive... After you get one made do they make more to sell them or will it just be a one off? Btw (sorry couldn't edit the first post) this is also on my deviantart 'gallery'. It's got some more details about it, also a link to the unpainted Twinsen, which apparently has even more details... (and the photo of the unpainted one is actually clearer). Last edited by Momiji; 2007-03-26 at 08:18. A 3D printer drops layers upon layers upon layers of modelling powder, using water to wet the seperate layers instead of ink so that the model is built up. Or at least the one I've seen does! Great model by the way! What that 3D printer does really looks just like the stuff that this company that Darkflame posted is doing, you can also sometimes see those layers, and the material itself looks similar. Very cool idea actually, a modified normal printer that just dumps a layer upon layer of some plaster thing while the base just moves downwards - I wonder what is the limit for a model height. Fast, Affordable 3D Printing System"
Still, it would be cool to have something like that at home. But first you'd have to learn all that 3D modelling stuff on the computer. Is this what they use for making those smaller versions of real people? You know, the one where they make a 360 degree scan of you, then later you come and pick up a scale 1:10 model of yourself? Eh, the last thing I made was a Winnie the Pooh, like 4 years ago? Damn... time flies... anyway he was pretty good looking. Last edited by Jasiek; 2007-03-26 at 12:25.